For all of those who were asking themselves where Lady Gaga is and what will here new scandal be, here it is! 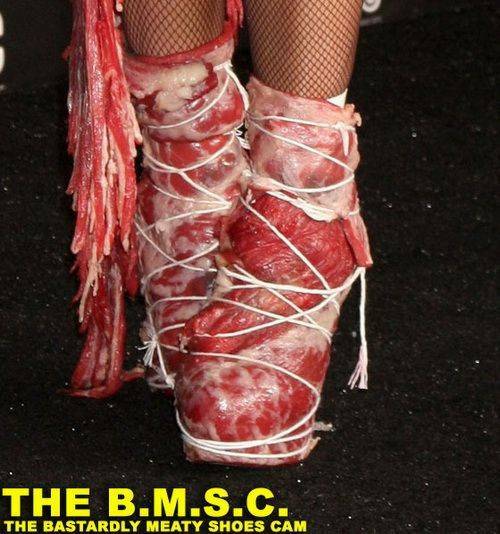 She appeared on MTV Video Music Awards wearing this tasty, but a bit undercooked dress made completely out of raw meat. The meat wasn’t covering only her dress, but both her shoes and small hat. She might have wanted to send a massage about unfairness of killing animals and wearing fur or something like that, but she didn’t said anything about that, so I guess her point pretty much was – hey everybody, look at me!